This month, Laurel Roth and Andy Diaz Hope begin their year as de Young Artist Fellows by setting up a research studio in the Kimball Education Gallery. 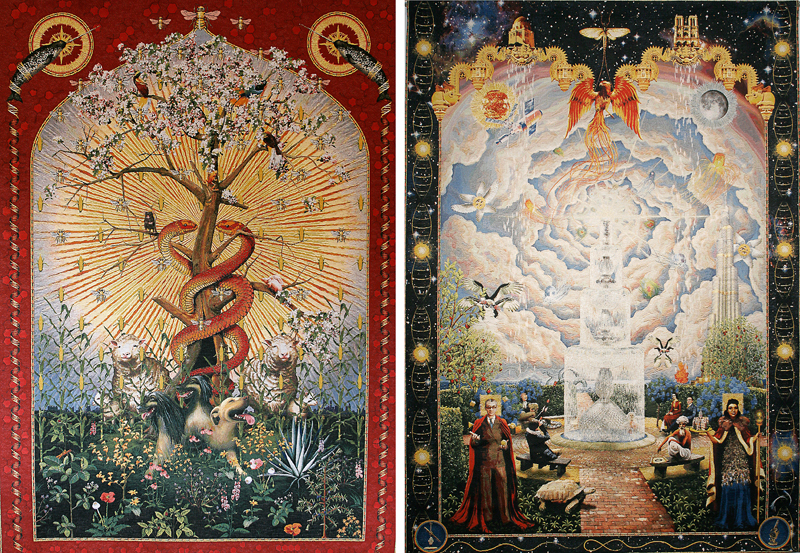 Roth and Hope will use this time in the Artist Studio to design the third piece in a triptych of tapestries, which will be known as The Conflicts . Here, the artists articulate the ideas, inspiration, and foundation of this, the final piece of their triptych. 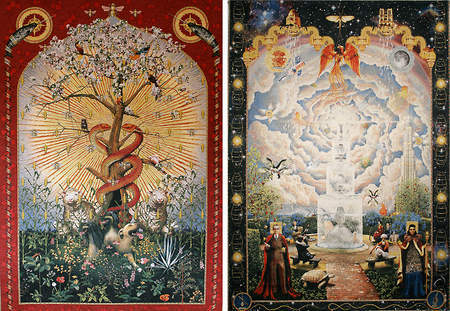 Our triptych of tapestries explores and illustrates three fundamental themes of conflict in literature. We investigated the theme of “Human versus Nature” in Allegory of the Monoceros, which revealed the end of Darwinian natural selection and the beginning of the age of human-centric evolution. In Allegory of the Infinite Mortal, our version of “Human versus Him/Herself,” we created a contemplative garden tableau that represented various scientific and philosophical structures used throughout human history to examine the concepts of infinity, immortality, and our place therein. The final theme in the triptych is “Human versus Human.” We have spent the past several months reading and researching, simultaneously expanding our knowledge and narrowing our focus into a cohesive idea. While war might be the most obvious interpretation of this concept, we don’t feel like we have the personal experience or knowledge to do the topic justice. After spending days at the San Francisco Public Library and tossing ideas back and forth, we finally realized that we wanted to flip the theme on its head, focusing instead on how human evolution has been driven by a combination of cooperation and competition in the face of conflict. Contrary to more savage interpretations of “survival of the fittest,” cooperation has often been the path to success for individual organisms and societies. Human evolution is entering a new age of globalization that is deeply enmeshed with technology–this tapestry illustrates questions of how cooperation and competition have shaped and will continue to shape this trajectory. 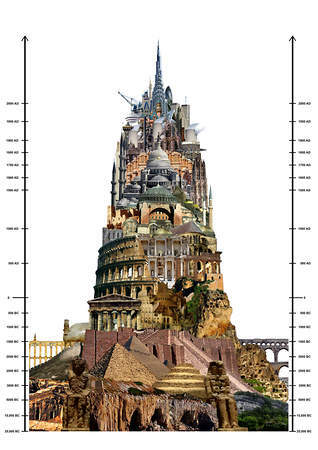 To demonstrate this, the third tapestry focuses on a massive Tower of Babel—a classic, though ultimately doomed, example of human cooperation. 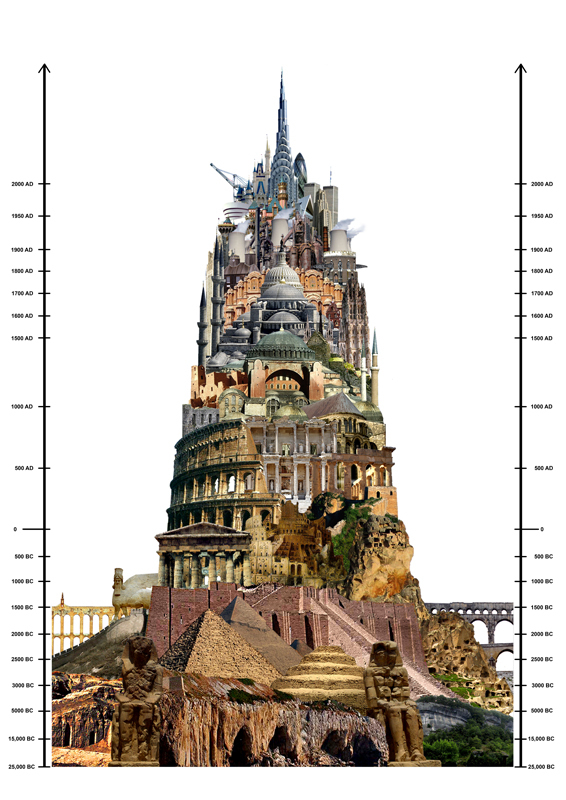 Compiled of a variety significant dwellings and iconic architecture, the tower roughly represents a historical timeline rising vertically from the dawn of mankind to the present day, ultimately disappearing into the uncertain cloud of the future. 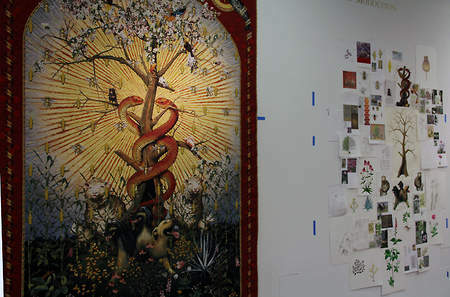 During this part of our fellowship in the Artist Studio, we’d like to share the process that went into the design and creation of the first two tapestries as we work on the third. We’d also like to invite museum visitors to contribute their own ideas about what “Human versus Human” conflict means to them. In this way not only will we learn from a larger sampling of human experiences, but also add an element of cooperation into the design of the piece. Join the artists to see the process of creating a tapestry, contribute your ideas, and view the first two finished works of the triptych. During their yearlong fellowship, the artists will present works-in-progress and related demonstrations and lectures, with the support of their collaborating organizations Magnolia Editions and Bergarde Galleries, and culminating in a final exhibition of The Conflicts in March 2013.